“That egg is mine! I saw it first,” says Goose. “I touched it first. It’s mine,” declares Duck. Like James Marshall’s George and Martha, and Rosemary Wells’s Benjamin and Tulip, Duck and Goose have to work at getting along. You see, Duck doesn’t much care for Goose at first–and Goose isn’t fond of Duck–but both want the egg that each claims to be his. As the two tend to their egg, and make plans for the future, they come to appreciate one another’s strengths. And when a bluebird points out that it isn’t really an egg–it’s a polka dot ball–the two are not dismayed. After all, it is a lovely ball. 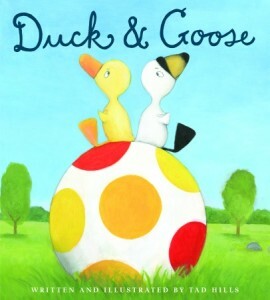 . . .Filled with humor that young children will appreciate–and recognize!–and starring two unforgettable characters, Duck & Goose has all the ingredients of a classic-in-the-making.